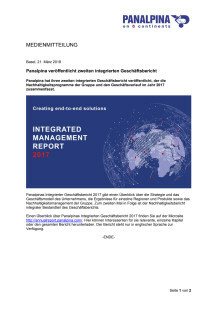 The Panalpina Integrated Management Report 2017 gives an overview of the company’s strategy and business model, the development of its products and regions, and its approach to sustainability management. 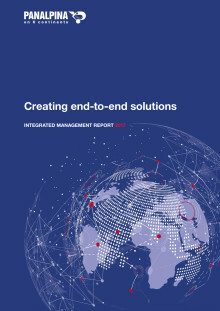 For the second year, the report integrates the discussion of Panalpina’s business performance and sustainability. 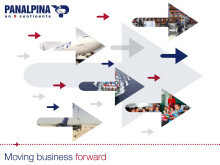 The Panalpina Group is one of the world's leading providers of supply chain solutions. The company combines its core products – Air Freight, Ocean Freight, and Logistics and Manufacturing – to deliver globally integrated, tailor-made end-to-end solutions for eleven core industries. Drawing on in-depth industry know-how and customized IT systems, Panalpina manages the needs of its customers' supply chains, no matter how demanding they might be. 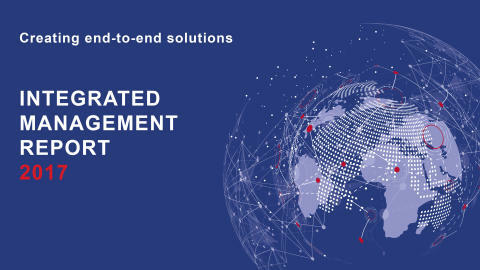 Energy and Project Solutions is a specialized service for the energy and capital projects sector. 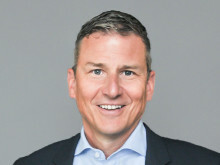 The Panalpina Group operates a global network with some 500 offices in around 70 countries, and it works with partner companies in another 100 countries. Panalpina employs approximately 14,000 people worldwide who deliver a comprehensive service to the highest quality standards – wherever and whenever.